这个工作不是针对解决实际问题的，比较有趣。我这里就简称为“搭积木”问题了。由于最近的工作，有一个类似的问题，就是研究球体随机排布的，寻找一个计算机模拟的拓扑结构，来看非均质材料的宏观性能。不过这个问题已经在上世纪80年代，被一批物理学家做完了。现在就是拿来做做工程应用。Torquato还有一本书关于非均质材料细观力学的，Random Heterogeneous Materials: Microstructure and Macroscopic Properties, Springer (2001). 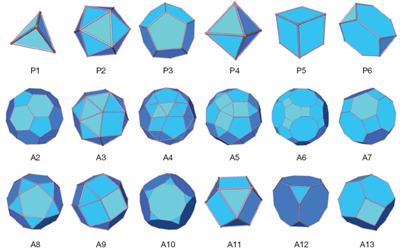 Torquato and Jiao, Dense Packings of the Platonic and Archimedean solids. Nature Vol 460, 13 August 2009. Liu and Nagel, Nonlinear dynamics: Jamming is not just cool any more. Nature Vol 396, 05 November 1998. 发布在科学工作 已有标签 科学, 论文. 将该链接存入书签。 发表评论或留个互链：互链地址. There is a small error in this Fig. (P1-P5;A1-A13).